What a day. You’ll have to forgive me for getting this blog post up a bit later than usual, but it’s been a little hectic around these parts, what with Roy Halladay not being traded and Scott Rolen being traded to Cincy prior to today’s deadline. In short, the Blue Jays weren’t blown away by any offers for their ace, so he’s staying put. GM J.P. Ricciardi said he’d still be open to listening to offers over the winter, but hoped the proposals would be better than they were this month. Unlikely, since Halladay’s value was at its highest now, when he could’ve been had for a season and a half. As for Rolen, it came as a bit of a shock that he was traded with only a few minutes left before the 4 p.m. ET deadline. On the surface, the trade didn’t really make sense for the Reds. Then, we find out Rolen requested to be traded closer to home for what Ricciardi called “personal reasons”. I was told it was something related to his family. It actually worked out well for the Jays, because Rolen’s value was as high as it’s been in years. After four seasons of dealing with left shoulder issues, Rolen was putting together a fantastic campaign and playing Gold Glove defense once again. As a result, the Jays got two pitchers (reliever Josh Roenicke and Minor Leaguer Zach Stewart), along with third baseman Edwin Encarnacion. Roenicke will join the Jays’ bullpen on Saturday, with reliever Jeremy Accardo being optioned to AAA Vegas. Stewart will tote his 1.67 ERA ERA (across these Minors levels this year) to Vegas as well. Ricciardi said they ultimately see Stewart as a starter, but some Toronto scouts think he could reach the bigs faster as a late-inning reliever. I will say this, I will miss watching Rolen play. He never ceased to amaze on defense and I loved his old-school, head down, full sprint around the bags after hitting a homer. Rolen has his quirks, but he was easy to talk to and was great to the print media. I’m sure Halladay will miss having him behind him scooping up grounders as well. While standing outside the visitors’ clubhouse at Safeco Field this afternoon, Blue Jays third baseman Scott Rolen walked out of the room, stopped by us writers, suddenly looked stunner and pointed back toward the locker room. “Did you guys know they’re thinking of trading Doc?” Rolen deadpanned. “Where’d ya hear that?” one scribe jokingly replied. 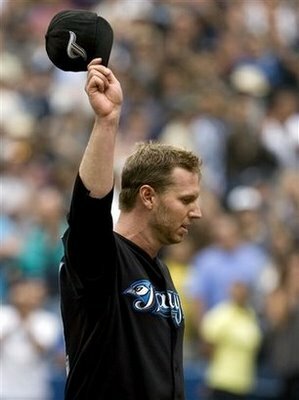 Meanwhile, Halladay was at his locker, putting on his Jays uniform. The good doctor is still here and he’s still scheduled to start tomorrow for Toronto. Today was the self-imposed “deadline” that general manager J.P. Ricciardi set for potentially trading Halladay, but it looks as if these talks will keep going. Ricciardi did not return several messages. Not a big surprise there, since J.P. has been offering up no comments for the most part since Halladay’s last start. What we know? Jays and Phillies are still talking, but Philadelphia may be turning its attention to Jarrod Washburn and Cliff Lee given the Jays’ asking price for Doc. One of the Phillies’ top officials is here in Seattle to keep an eye on Washburn’s outing tonight and for Halladay’s start on Wednesday. I’ve heard conflicting reports about whether the Jays have someone scouting Phillies shortstop prospect Jason Donald today, and depending on where you’re browsing the web, the Red Sox may or may not have made an offer. Elsewhere in Bird Land, the Jays activated righty Scott Richmond on Tuesday and optioned reliever Drik Hayhurst to Triple-A Las Vegas. Brian Tallet will remain in the bullpen, considering he has already chalked up a career-high in innings. Adam Lind has the day off and Vernon Wells is temporarily in the No. 3 hole in the lineup. UPDATE: Told that the Jays do have a scout in Lehigh Valley to watch the Phillies Triple-A team (Jason Donald and Michael Taylor are playing). Also, interesting that there is no representative from the Jays front office on this trip to Seattle. I’m also told that no front-office types are scheduled to travel to Oakland. Just a thought: If Toronto does decide to trade Halladay — the face of the franchise — wouldn’t that be something he’d be informed of face to face? I’d think so. So, if the general manager shows up on the West Coast, it likely means something’s up. Let’s take a break from all this Roy Halladay stuff for a minute, ok? No? Fine. 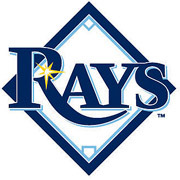 A report indicates that the Phils rejected an offer from the Jays that would’ve swapped Halladay for Kyle Drabek, J.A. Happ and Dominic Brown. As I’ve written numerous times this season, no one is more frustrated with Wells’ showing this year than Wells himself. He finally put together a nice little 10-game run before the All-Star break, but then came down with a bad flu bug and missed three games. Since then, he has gone 2-for-16 at the plate, entering Saturday’s game. Manager Cito Gaston was asked if there was any way to explain the drastic difference in Wells’ numbers at home versus on the road. If you were at Rogers Centre on Friday night, you might have heard the loud boos directed Wells’ way all evening. Gaston said that could have a little something to do with it. Gaston also talked some about right-hander Casey Janssen, who was activated from the DL on Thursday and optioned to Triple-A Las Vegas rather than being called up to rejoin the Jays. The manager said Janssen isn’t quite ready to come back, but when he does, the pitcher will likely be a reliever again. Asked if Janssen was being viewed long-term as a reliever again, Gaston said he wasn’t completely sure. “I have different thoughts about guys in bullpens and guys that start that have bad arms,” said Gaston, referring to Janssen’s recent shoulder woes. “To me, I’ve always thought that maybe the bullpen was the worst thing for you, but everybody seems to think — and maybe he’s proved that, too — that he’s better off in the bullpen. I don’t know. Happy Halla-Day everyone. If this indeed the swan song of the good doctor in Toronto, let me just say that Roy Halladay has been a joy to cover over the past few seasons. We tried to chat some with GM J.P. Ricciardi before the game tonight, especially considering he altered his story about Halladay presenting the team with a list of teams to which he’d approve a trade. Ricciardi was in no mood for talking. Fair enough, I guess. I mean, what else is there to say, really? Ricciardi said a whole lot on Thursday and ended up having to clarify a bunch of his comments. It’s possible that Ricciardi also irked Halladay a little by some of the things he revealed. Here’s what we know: the Phillies continue to be the front-runner to land Halladay in a deal, there are at least four teams considered to have serious interest, and the Jays have run a list of teams by Doc to see where he’d prefer to be moved, if he’s moved. There were rumors that a deal was close with Philadelphia and could be finalized in the next 24 hours. That was inaccurate. Everyone seems to be chiming in on this Doc Halladay saga these days, too. Chatting with manager Cito Gaston today, us scribes decided to see if there were any updates on injured starters Shaun Marcum and Dustin McGowan. A pretty routine move for a relaxed afternoon pregame session. Marcum made a successful rehab start on Tuesday, but there’s no established timetable for his return to the rotation just yet. McGowan? He had knee surgery a few weeks ago. Stunned silence from the reporters. “What, you guys didn’t know that?” Gaston asked. Umm, no. And I’m pretty sure we’ve asked how McGowan was doing at some point over the past couple weeks. But, I digress. Back to the point. According to general manager J.P. Ricciardi, McGowan — already on a long road to recovery from the right shoulder surgery he had July of last year — blew his left knee out while running during routine conditioning drills. He had surgery on July 9 to repair cartilage and Ricciardi said the pitcher needs roughly six weeks to recover from the operation. It’s another setback for a pitcher who was supposed to be a legit No. 2 guy on the staff by now. That was before his shoulder issues came up last season. Back in May, when the Jays were on the road in Atlanta, I spoke with McGowan after he began working through some long toss sessions and he sounded optimistic about his progress. He just can’t seem to catch a break. When it was clear that McGowan’s pace made him a long shot to return early this season, as the team initially hoped, the chances of him returning at all this year became slim. Now, there’s zero chance you’ll see McGowan back with the Jays this season. At this point, given this latest setback, all Toronto can do is wait to see how McGowan looks come Spring Training. What does it mean if the Blue Jays do decide to trade ace Roy Halladay? Asked that question recently, catcher Rod Barajas smirked, knowing that he and the reporters surrounding him all knew exactly what such a move would mean in terms of the direction the organization was heading. It would mean the focus has shifted toward being competitive in 2010, or perhaps even further down the road. Barajas paused, realizing where he was going with his thought. The reality is that the club was looking ahead to 2010 before this season began. That changed some when the Jays got off to their hot start. Given the recent slide, though, it makes complete sense to question if contending next season is realistic with the current nucleus of players. Even with all that being very much the case, the players inside Toronto’s clubhouse don’t want to believe that there isn’t enough time to still make a run at the playoffs this season. Obviously, having Halladay leading the young rotation would be necessary for that type of miracle turnaround to happen. Rookie Ricky Romero doesn’t like that people are dismissing the Jays already. Chatted with Vernon Wells today about his thoughts on the whole Halladay saga. More on that later on bluejays.com. SIDE NOTE: I will not be at the ballpark tonight. For some Blue Jays’ updates, you can follow @BlueJays or @e_gilbert on Twitter. Catch you from the ‘yard tomorrow.